Wontons, also referred to as wonton wrappers, are made with ingredients similar those used in pasta and made in small, square sheet form. 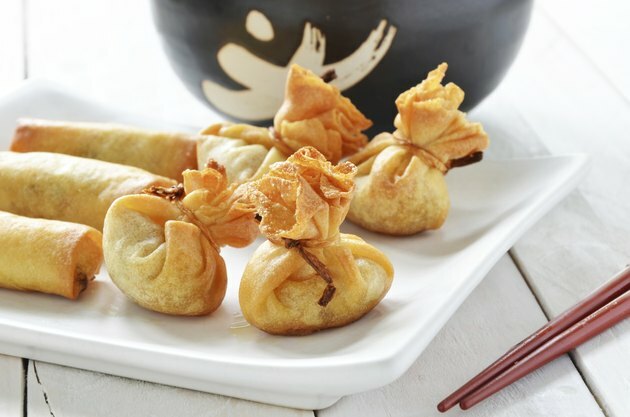 Wonton wrappers come from Chinese culture and can be prepared in several ways, from boiling for a soft texture to baking in the oven for a crispy outside. When baking your wrappers, you can either position them into small, edible cups that can be filled with meat and cheese or roll the wrappers up like egg rolls. Preheat your oven to 350 degrees Fahrenheit while you prepare your wontons. Lightly coat both sides of the wonton wrapper with butter or butter-flavored spray. If you're using regular butter, spread on a thin coat with a butter knife, or use just enough spray to thinly coat both sides. Gently insert one wonton wrapper into a muffin cup on your muffin pan; it should form a small cup. For large wonton cups, use a large muffin pan. If you want small, bite-sized wontons, use a mini-muffin pan. Bake the empty wonton wrappers in the oven for up to five minutes, or until the edges start to turn a light brown color. Remove the muffin pan from the oven. Fill the empty wonton cups with your favorite ingredients, such as spinach and cheese or chicken and veggies, while they are still in the muffin pan. Place the filled wontons back into the oven and bake for up to five more minutes, or until the wontons start to turn a golden brown and the fillings are warmed. Remove the pan from the oven and let the wontons cool for up to five minutes. Gently remove the wonton cups from the muffin tin by delicately pulling up on their edges. Preheat the oven to 400 degrees Fahrenheit while you prepare your wonton rolls. Lay one wonton wrapper out on a counter top and add your filling, such as beef and veggies, to the middle of the wonton wrapper. Fold two opposite corners of the wonton over the filling; the two corners should point to each other. Although they don't have to be touching, they should be folded over the filling. Fold a third corner over the two previously folded corners and over the filling as far as it stretches, resting the point on the opposite corner's side. This third corner should now be pointing in the same direction as the last unfolded corner. Roll the wonton gently toward the point of the fourth and final unfolded corner's point. Drop a few droplets of water under the outermost corner and press gently to seal the wonton roll. 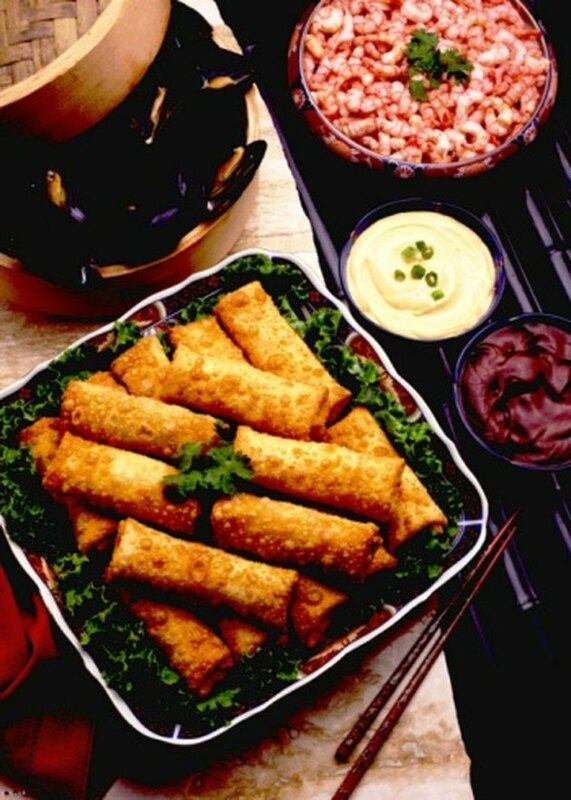 Place the wonton rolls on a baking sheet and bake them for up to 12 minutes, or until the wonton appears golden brown. Remove them from the oven and serve hot. Make sure to cook your wontons thoroughly to avoid food-borne illness. The U.S. Department of Agriculture recommends keeping your food above 140 degrees fahrenheit to prevent pathogen growth. Store any leftovers in the fridge.